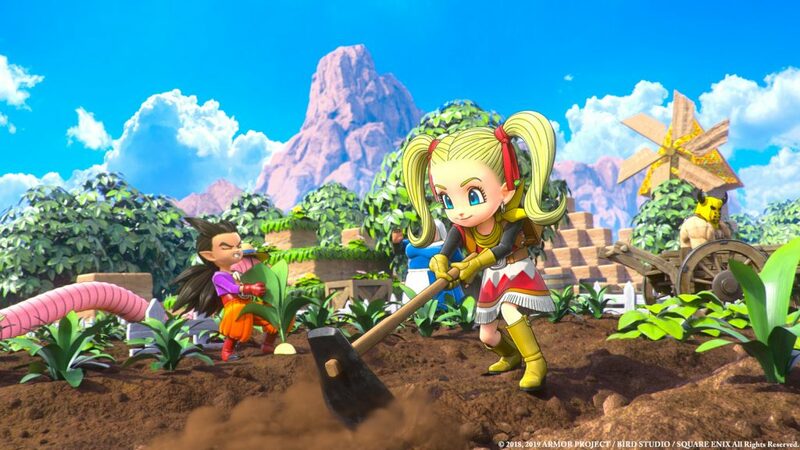 When they announced Dragon Quest Builders 2 I was so excited that when it finally released in Japan I bought it, regardless of what language it was in. I wanted this game. If you haven’t had a chance to check out DQB1, you really should. It’s on almost every platform out there, so you don’t have an excuse. Unless that excuse is a lack of money, that’s a pretty good one. DQB1 was easily one of my favorite games of all time, but in many ways, it limited itself and never quite realized it’s full potential. This game built on everything great and demolished the bad! If you’re unfamiliar with this series, image Minecraft fused with your favorite old school RPG. There’s not just one, but two level bars, so eat your heart out grinders! First is your own personal level, gaining experience the old fashioned way: by killing insane amounts of monsters. The second is your base level. Townsfolk will drop hearts, gain enough and you can ring a fancy bell that will level up your base, add new people to your town’s roster, and more importantly unlock new building options! This sequel does a fantastic job building upon its already great foundations. Before you were limited to a limited plot of land and only the things you built in that area counted to the player. It was a limit that unfortunately stifled creativity, but those limits are now (mostly) out the window! Instead of limiting where you can build, DQB 2 only limits the number of special rooms you can make, and how high you place them. Limits which I’ve yet to reach, and ones that don’t seem to stop the online community from creating and sharing some genuinely awe-inspiring creations! Where this game truly shines is in the depth of its room options. There are hundreds of different items/furniture pieces to create, and if you arrange certain ones just right you can create a special room that performs a specific function. Put a few fire pits, a storage container for food, a place to eat and you’ve got yourself a kitchen! Now your ever growing populous can cook food for you as well as have a place to feed themselves. This is just one example of the dozens of different room possibilities you can create, each with their own style and purpose. Before you were limited to third-person view only, but it has adopted a new first-person view you can switch between for a more detailed building mode. Adding on to the simple hammer used for smashing, this game introduces various tools the player can use to speed up the building process. A new stamina feature allows for swimming and dashing, which were both sorely missing from the first iteration. In the first game in the series, your townspeople felt utterly useless. When your town came under attack by monsters, they did very little to hold them at bay. Once the monsters were sorted, they would walk around, or sit back and watch as you build an entire town on your own. Now, you create a plot of land and put some seeds nearby, not only will they till the area, they will water, plant, sow, and store all year round. Build an armory, and they outfit themselves in your crafted arms and armor. Put down some heavy artillery; they will man the walls! Toilets and a towel create a bathroom where they can do their business. Each action, even them dropping a digital deuce, also grants base experience. Their hard work pays off for the base as a whole, making it feel like a living, breathing community. Like most Dragon Quest games, the story is simple but full of fun and exciting characters. If you’ve played DQ2 then you’re already way ahead of anyone just jumping into the series, in fact, it even spoils a lot of this games ending for you. Never was there a dull moment here. The pacing of the game always kept me excited the entire way through. Inbetween each significant chapter you find yourself back at your island where you have (nearly) unlimited potential to build whatever you want. With each arc done your book of building recipes is expanded tremendously, so the moments between the major story arcs were something I looked forward to just as much as the next major plot location! Combat is still the oversimplified hack and slash fest it was before, but this time around you have competent NPC allies, a wide range of enemy monsters, and strategically capable artillery, the combat aspect of DQB2 has evolved into something I’ve bumped up from “a pity”, to somewhere around “tolerable”. The downside to having to rely on your allies and creations is that I found the enemies are much stronger than DQB1, and you are much much weaker. This was quite frustrating at first, but when fights turn into large scale battles, you find yourself enjoying the grand scale of things. Music and sound effects are great, but you won’t run out and buy the soundtrack. There have been some complaints from others regarding frame rate issues and heavy battery drainage. I’ve experienced neither, the game ran smooth as butter in both docked and in portable mode, and I was able to play for hours before having to find my charger. There was one new aspect that I found myself livid over, but quickly found a way around. Growing up, I was a huge fan of Legos and would spend entire days creating massive ships or buildings. It was a rewarding experience knowing that I had created something so unique all on my own. DQB1 would task you in doing just that, and when you were done with a village, you could look around and take pride in the fact that it was your doing. Now, NPCs will place a chest near a construction site with the necessary items inside, and the entire town will then build the blueprint for you. That’s right, a building game that has auto-build. That’s the equivalent of an FPS where your enemies shoot themselves in the face the moment you see them. People play this game to build remarkable structures, and they had just taken that away from the player. But then I realized I could smash the chest and steal all the materials. This caused everyone to look around confused and unsure of what to do with their lives, eventually returning to their day jobs in the kitchen and fields. Leaving me to do what I love most, building! I can’t say enough good things about this game. Even after beating the story and feeling satisfied with it’s ending, there is still plenty to do. Side building quests, unlockable recipes, secret bosses, and of course, building up your kingdom, your way. I give Dragon Quest Builders 2: 9 slimes out of 10. Download the demo for either game to dip your feet in, I promise you won’t be disappointed.